This article is about the philosophy upheld by the Greybeards. For details on its usage, see Thu'um. The Way of the Voice is a philosophy regarding the use the thu'um, or the Voice (a form of Nordic magic). It was discovered in the fifth century of the First Era by Jurgen Windcaller, also known as the Calm, and its beliefs are so embedded in Nordic culture that some outsiders are left with the impression that the Voice and the Way of the Voice are synonymous terms. The main precept of the philosophy is that those who can wield the Voice should only do so in times of "True Need". Due to the rarity of times of "True Need" and the nonviolent lifestyles of the Greybeard monks (the most famous practitioners of the Way of the Voice), the philosophy is generally viewed to be one of pacifism. Actually, the Way of the Voice teaches that using the thu'um for battle is merely "the least of its uses". From the dawn of time and throughout most of the Mythic Era, the dragons were the only creatures who could harness the power of their voice for great feats of magic, though they only did so in times of "True Need". But the dragons and their followers changed, and man, who had worshipped them, rebelled. The dragons began indiscriminately slaughtering them under the orders of Alduin, Firstborn of Akatosh, who had chosen to forsake his proper duties and conquer the land. 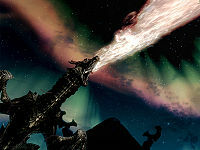 During this Dragon War, the dragon Paarthurnax took pity on the Nords (purportedly at the request of Kyne), and instructed several in the ways of the thu'um so that they could channel the power of their own voices using the tongue of the dragons. These first Tongues (masters of the Voice) used their new power to turn the tide of the war, and they eventually "shout[ed] Alduin out of the world". The remaining dragons were hunted and killed until they were nearly extinct, and the great Empires of Man were allowed to emerge. During the Skyrim Conquests around 1E 240, great Nordic war chiefs were also Tongues (Derek the Tall, Jorg Helmbolg, Hoag Merkiller, etc.). They needed no typical siege weapons when attacking a city, instead using the Voice to break down the city gate and allow their armies to storm in. Armed with the Voice, they were nearly unstoppable. However, the Nordic armies suffered an ignominious defeat at Red Mountain. The defeat greatly troubled the most powerful of the Tongues, Jurgen Windcaller. Jurgen meditated for seven years to "understand how Strong Voices could fail". Looking back on history, he realized then that the only strong voice is one which is used judiciously and with the goal of preserving the natural order, and he "chose silence". Thus, the Way of the Voice was born. When Jurgen began proselytizing this understanding to his fellow Nords, seventeen other great Tongues disputed him, and challenged him to combat to prove their point. It is said that Jurgen swallowed the Shouts of these Tongues for three days until they were exhausted. Afterwards, they acknowledged his superior skill and wisdom, and traveled with him to the highest slopes of the Throat of the World, where Jurgen set his new home, devoting it to the studies of the Way of the Voice as a philosophy of peace and inner balance. The monks devoted to this philosophy came to be called the Greybeards, who devote themselves to meditation at secluded High Hrothgar. The Greybeards have never been known to take up arms directly, but in the rarest of occasions, they will speak, and set great chains of events in motion. One such time was to announce the destiny of the great Tiber Septim, who united Tamriel into the Third Empire and later became Talos, the Ninth Divine. In 4E 201, the Greybeards spoke again to call the Last Dragonborn to High Hrothgar for instruction on the use of the thu'um. The Way of the Voice teaches that the Voice must be used only for the worship and glory of the gods, and that true mastery of it can only be achieved when one's inner spirit is in harmony with one's actions. The Greybeards believe that only in the contemplation of the Sky (the domain of Kynareth) and the practice of the Voice can a man achieve this harmony. This philosophy is exemplified in a motto of the Dragon tongue: Lok, Thu'um "Sky above, Voice within". 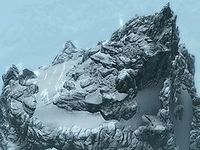 Any Nord with particular talent for the Voice could make the journey up the 7,000 steps to High Hrothgar in order to study with, and possibly join, the Greybeards. Etched tablets recounting the story behind the Way of the Voice are placed throughout this path, and people have been known to make pilgrimages up the mountain to view some or all of these tablets and meditate upon their lessons. While the Greybeards are famed keepers of the Way of the Voice, the core precepts of the philosophy are still reflected in Nordic culture. What constitutes "True Need" may be the subject of debate, but it certainly does not include wars of conquest (and may not even encompass a single individual's survival). So, ever since Jurgen's epiphany, the Nords have mostly abandoned the use of the Voice in offensive warfare. A Dragonborn (or Dovahkiin in the Dragon tongue) holds a special place in Nordic culture and in the Way of the Voice. A Dragonborn can absorb the souls of slain dragons, thereby absorbing knowledge of their language. Such knowledge can also be absorbed from other Tongues, thus a Dragonborn can learn in a short time what it would take other Tongues a lifetime of intense training and study to achieve. A Dragonborn is an archetype of Nordic culture, a powerful savior who represents everything a Nord should be. It is believed that a Dragonborn's abilities are a result of being blessed by Akatosh, and that a Dragonborn is sent to defend mankind from evil. 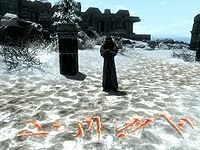 Since that implies that there is a great evil from which mankind needs defending, and that the Dragonborn will need the thu'um to stop it, any use of the thu'um by a Dragonborn is presumed to be done in a time of "True Need". Thus, when a Dragonborn is revealed and is in need of guidance or training, the Greybeards are quick to oblige.